The plate armours became popular during the middle of the 13th century succeeded by full plate armour during the late 14th century. Germany and Italy were the main centres of the production of armour. The armours were mainly produced in “Gothic” style. This replica has been reproduced Italian Gothic design. 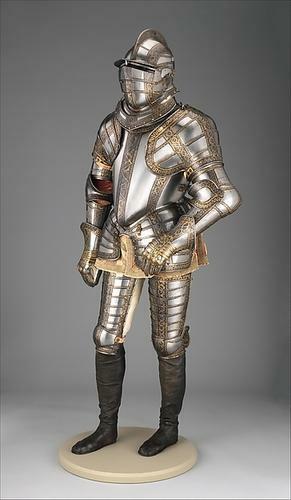 The armour offered a great deal of protection and comfort and was well acclaimed throughout Europe. It provided a rounded surface to both lance and sword. This armour is made of 18 gauge steel and comes complete with full skeletal body and decorative skirt. Leather straps come attached. The wooden pedestal gives it an alluring height of 7 feet.